A large part of your success hinges on the relationship you have with the course’s subject matter experts. They play a critical role by providing guidance, expertise, and context for much of your course’s content. However, the subject matter experts can also be a source of frustration. Many times they won’t budge when it comes to getting rid of extra information. Or they have their own ideas on how the course should be designed which conflicts with yours. In today’s post we’ll review some challenges when working subject matter experts and how to overcome them. Here are some common challenges when working with your subject matter expert. They know everything. Their expertise comes from years of experience. Often they lose sight of this when trying to teach new people. Because of this, they tend to over emphasize the value of some content or think everything is equally important. They’ve invested time in existing content. Much of the material you get comes from existing classroom content. And often this content has been created by the subject matter experts. That means they’ve already invested time in building the course just the right way. They’ve also spent time selecting color schemes, fonts, and clip art. Their expectations are based on experience. One reason there are so many linear, click-and-read courses is because that’s what people think elearning should be. It’s what they’ve experienced so it must be right. Plus, a linear course is a systematic way to ensure that all of the important information is presented. They don’t want the fancy schmancy bells and whistles. Interactive content seems like extra work with a bunch of bells and whistles. Why do you need more than a few slides of information and a multiple choice quiz? Seems like a waste of money to build interactive scenarios. Also, who has time to create all of those branches? It’s hard enough to come up with ten good quiz questions. They’re not part of the project team. I’ve worked on plenty of projects where I need to do research and the client directs me to a subject matter expert. Often the experts don’t know anything about the project and they can get a bit territorial when a non-expert steps onto their turf. Because of this, they aren’t always committed to the success of the course. To them, you’re an intrusion on their productivity and possibly even a threat to what they do. While it can be challenging working with subject matter experts, they do a place an important role in the construction of your online training program. Because of this, you need to mitigate some of these challenges. Bring in multiple perspectives. Subject matter experts are the experts of the content. But they’re not necessarily the experts when it comes to teaching the content. Their perspective is just one part of the equation. To get a different perspective recruit recent learners of the content. Have them go through your objectives and provide some insight on what worked and what didn’t as they were learning. Step away from your pre-existing content. Don’t allow the existing content to dictate what you need in your course and how it needs to be designed. It’s just a resource as you research the right content for your course. One challenge is when the existing content is in PowerPoint and you use a PowerPoint-based authoring tool like Articulate Presenter to create the elearning. Once the expert knows you’re using PowerPoint, he tends to become less flexible. That’s why I like to start with a blank screen in a starter template. It forces the project to be started from scratch. I also prefer not to tell the experts that I am working with PowerPoint. That diffuses many of those issues. Show examples of good elearning. We’ve all had to take the standard linear elearning, where all we’re required to do is click the next button. If you build elearning courses, you’ve probably seen enough diverse examples to know that there’s more to interactive elearning than the next button. 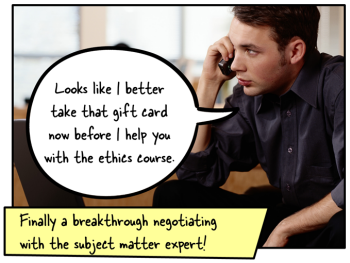 But most subject matter experts only know what they know or have experienced. So if you want them to build a different type of course be prepared to show examples of good courses that are similar to what you’d like to build. Once they see it, they get it. Also, the biggest question will be how to ensure that the learners see all of the content (which drives a lot of linear elearning). Be prepared to answer that question. Pay now or pay later. It’s true that a lot of interactive content is novel and may be classified as bells and whistles. But the reality is that you’re making an investment when you build an elearning course. And the organization wants to make sure that the investment pays off. If not, it’s a waste of time and money and requires making an additional investment down the road. So why not do it right the first time? Going with the tip above, show them good examples of effective interactive elearning. Also, instead of starting with a linear, sequential design (which is standard) use a backwards design where you start from the final assessment and work backwards. This way the course is focused on assessing the desired behaviors rather than the novelty of interactions. Honor the subject matter experts’ contributions. Just like you and everyone else, the subject matter expert is pressed for time. So having to spend time on a project they’re not part of is low on their priority list. The easiest thing is to get them on the project and have the client make your project a priority. But if that’s not possible, then find ways to honor their contributions. Send emails that rave about what they’ve done and CC their managers. This is good to do right before their annual review. Give them an occasional gift card from Starbucks or Amazon. Be committed to do anything to build good will and positive regard. Also, don’t waste their time. Set clear expectations and make sure to follow through. Subject matter experts play a key role when developing your course content. Because of this you’ll want to develop a good working relationship that is respectful. Often I find that our industry complains a lot about the subject matter experts. They’re not our adversaries. They’re partners in the organization’s success. By following some of the tips above you’ll build a good relationship and shape the perspective to build effective and meaningful online courses. What challenges do you face when working with subject matter experts and how have you resolved them? Share your tips here. Soem useful pointers in the piece. It’s vitally important for a healthy project that the ID be assertive over the ID role. A lot of the typical pitfalls in SME-ID relations can be avoided by agreeing very explicit briefs before development begins, clearly setting out the ID’s and the SME’s remits. A good project manager will play a role in this. The ID is bringing pedagogical understanding to the table (or should be), particularly w.r.t distance and online learning theories and strategies, and the promise and limitations of the favoured ed tech of the day. The SME is bringing SUBJECT-matter expertise to the table. The fact that an SME may also have had involvement in teaching or training of the subject-matter is neither here nor there (as is, likewise, any incidental knowledge of the subject-matter the ID may have). If, as often happens, the project sponsor is trying to cut corners by employing as an ID a PowerPoint or rapid-tool operator who lacks an education background, that’s an entirely separate discussion. With so many of these misnamed IDs around these days, it’s likely that there are SME who’ve had experience dealing with them and will feel impelled to influence the pedagogy of the course to compensate for the ID’s lack. This topic is near and dear to my heart. Last year, I had two projects where working with the SMEs needed more structure. I looked high and low for advice on how to deal, and found precious little. So at the risk of self-promoting (which I sort of am), I am writing a book on this topic with a methodology for dealing with many different types of SMEs. I’ve boiled it down to four types and how to work with them. This article is very helpful because you have parsed the issue in a very different way than I have, and I appreciate your perspective. Thank you for all your hard work in elearning. I’ve been reading your blogs for several years and they are full of great advice. As for SMEs, it is an issue that I hope gets more attention, because it certainly needs it! I’ve worked with many SMEs over the years and one obstacle I run in to over and over again is the SME that wants to be the keeper of the information. In my experience, this is usually a power issue. Or perhaps, they think of it as job security. In these cases I find persistence to be the answer. Just keep asking questions and make sure the gaps are filled. It can be painful, but eventually I get the information I need. The second issue I experience is your SME is often so busy that meetings get missed and deadlines go by and you don’t get the information you need. First, set realistic expectations of the time commitment from a SME that your project requires. Next, communicate this time commitment to the business partner and reach an agreement as to how much of the SME’s time they are willing to commit. Finally, hold your SME to this commitment. This is the hard part. Sometimes this requires going back to the business partner, letting them know you are not getting the time or results needed to develop your eLearning. Of course this requires a fair amount of tact and sometimes the business needs outweigh the Project. This is where you may need to renegotiate the deadlines. Overall, I agree with Tom. Building a good relationship with your SMEs is the number one priority and will to a long way towards making the process easier. we could expose the SMEs to interactive elearning to give them a sense for what the finished product would look like. Here’s a de-logo-icized version of what we built. The client loved it, and loved seeing the different ways they could interact with us to get the job done. Some great down to earth advice here Tom. @Megan: nice job on the video and module. @Ruth: Good stuff. Commitment and accountability are key. Just possible something in here might be useful for someone out there. It was a talk mainly aimed at Modern Language SMEs about working with technologists on eLearning projects, although a couple of notes to technologists at the end, also. From the National Network for Interepreting. Great post! Megan I love your work. I’ve been trying to decide which authoring tool to purchase and as a result of participating in your short module for SMEs, I’ve decided on Storyline. Thanks! I have seen a lot of projects where a group is moving to a new software system. A SME is assigned to the project and works with both the software developers who are customizing the system to meet their needs and the training team to teach the new software. Very often, the SME thinks that all of the students know the current (old) system and only need to be taught how to migrate to the new system. They forget there will be turnover and new people hired who will also need to use the new system. These new employees don’t know the old system and need a different point of reference as their starting point. Sometimes, this will require two different courses: one for people who know the old system and another for anyone who is learning from scratch. Other times, they can be combined, but it is important to realize there are two groups of students. I always enjoy your blogposts – so practical. Thank you. I will also post a link to this post into my blog post. Hi Tom – great post. I don’t envy those who are faced with know-it-all experts. How true it is that those who are knowledgeable about a subject are often not the best (!) at putting that knowledge over to others. However the other side of the coin is that it could be all too easy to get overly cynical and dismiss their input as of little value. Tricky balance to strike I guess. really interesting post. you have given a very good description of the challenges that we face with subject matter experts and a good ways to work with them…. I find the biggest challenge is that the “teacher” (subject matter expert) often gets into a habit of reading their powerpoint slides. It creates a monotonous flow that feeds boredom for the learner and bad habits all around. This often inspires me to invite a script that is not powerpoint based.